Last summer, Sky Rogue took the highway to the danger zone…in an ice cream truck. If the roguelike combat flight sim somehow slipped under your radar in August, just try to imagine Ace Combat with a candy-coated arcade aesthetic. Now compliment that with a chipper electronic soundtrack by Pete “Phonetic Hero” Lepley and you’ve got yourself an indie game seemingly destined to grace a Nintendo console sooner or later. In fact, just two weeks ago, it did. Sky Rogue is one of most recent indie gems in the rough to call the Nintendo Switch home. 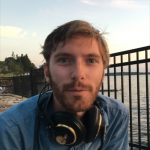 Yet the indie marketplace on the Switch grows more and more cramped with each passing week, and standing apart amidst the skirmish is no easy task. 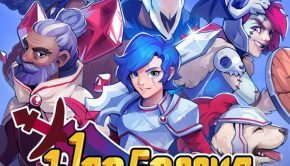 Even a project as distinct as Sky Rogue will have a tough time locking onto its target audience without an ace up its sleeve. Phonetic Hero could well be the ace Sky Rogue needs, but does this soundtrack elevate its parent project to new heights? Sky Rogue doesn’t have much fuel to burn and, even so, burns through it quickly. At roughly a half-hour’s length, the album has no time to waste delivering high-octane thrills. So “Kick The Tires & Light The Fires” takes just two minutes to brief listeners on everything they’ll need to know about the album. This first track is a showcase of bubbly synthwork – fizzy arps, pearly leads, and an edgy bass – undercut by beats at blistering speeds. So, too, is the rest of what’s on offer in Sky Rogue – though each track manages to mix things up just enough to keep from wearing into monotony. “Go Get ‘Em Ace” cools the album’s jets after the accelerated introduction, adding brass for a touch of implied heroism. “Re-Equip” keeps the album grounded in a slower tempo, evoking anticipatory moods with staccato strings and a methodical beat. From there, Sky Rogue is off to the races. “Cleared For Takeoff” electrifies the atmosphere with sky-high Moby-esque pads and adorable percussive synth arps. “Easy Cowboy” hybridizes Sky Rogue’s signature sound with old western elements like guitar, church bell, and a whistling synth lead that scales the vertical limit. “Bag Season,” co-created with fellow electronic musician Kubbi, takes on a wintery chill with its frosty synth bells and frigid reverb. Each of the last three tracks has a more aggressive iteration backing it up, whether through a heavier reliance on synthesized or electric bass or through more agile beats and arpeggiation. “Beaded Up” raises the stakes even further with a heavier focus on minor chords and frenzied staccato string action. Last but not least comes “Bravo Zulu,” Sky Rogue’s triumphant sendoff, packing in some groovy plucked string syncopation and one more wily synth solo. Even noting these distinctions, Sky Rogue’s tracks do tend to blur together, both as a consequence of the album’s short length and due to the lightning speed at which it moves. On the other hand, at no point does Sky Rogue overstay its welcome. The sense of uniformity across the album precludes any rough transitions from one catchy electronic tune to the next, and the album’s bite-sized proportions could only disappoint listeners clamoring for more of this riveting joyride. Sky Rogue may RTB a little early for some listeners, but the album provides an unadulterated adrenaline rush that screams “arcade combat flight simulator!” Time will tell how the game fares on its new platform, but at least Phonetic Hero’s music makes a compelling case for gamers to climb into the cockpit and log some flight hours. 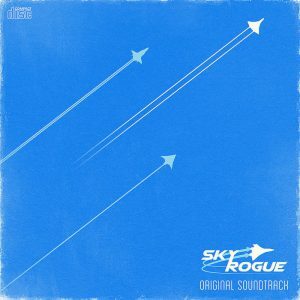 Regardless, the soundtrack to Sky Rogue is both smooth and exhilarating, and perfect for any pilot in search electronic music to send them soaring. Posted on May 10, 2018 by Reilly Farrell. Last modified on May 10, 2018.